KNOW Identity 2019 hit Las Vegas last week. The show brings together some of the brightest minds in the international identity community to discuss and debate the best way to manage and protect identity and PII in our increasingly digital world. Here is a recap of the biggest highlights and our key takeaways below. As with last year, Self-Sovereign Identity (SSI) played an important role in many discussions. Today’s brightest minds are grappling with the undertaking of securing digital identity, and many sessions – including Roger Dingledine’s keynote – highlighted the importance of privacy. Mastercard announced a corporate world-push into digital identity to bring trust into transactions, putting the individual at the heart of every digital interaction. Charlie Walton, the SVP of Digital Identity at Mastercard, walked through this vision (outlined in the paper “Restoring Trust in the Digital World,”) during the Tuesday morning keynote. There are many large players trying to commoditize SSI, but at the same time there is another path being created. TYKN exhibited at the show – the company is bringing digital identity to rural Africa through an open source offering. This is just one example of “out of the box” thinking to help solve the digital identity crisis. Biometrics adoption was another hot topic last week. Colleen Manaher from the US Customs and Border Control led a fascinating session about the use of biometrics, specifically citing the use of biometrics in airports as an opportunity to close the gap between security and customer experience. She argued that active private sector participation is at the core of effective, secure and privacy-preserving identity processes enacted by governments. When it comes to travel and airports, Americans view verification technology as a positive solution. According to our recent survey, 84% of Americans believe that biometrics will improve travelers’ airport experience, and the majority (59%) say that biometrics will increase safety because of improved identification accuracy. The adoption of fast and easy identity verification via document authentication that can be tied to biometrics, EIDs and other technologies has the potential to make flying a frictionless and fun experience again. Wandering the exhibitor hall shows more platforms offering bundles of identity authentication techniques using data aggregation, email, phone, identity document authentication and biometrics. With another 1,244 breaches last year – and one UK firm alone that had nearly one billion email addresses stolen – it’s important to use multiple techniques to ensure trust in your transactions. As we at Acuant have believed and known for a while, Identity has become a currency. Companies are now recognizing that identity is an organization’s biggest vulnerability; as such the verification and protection of identity data or PII (personally identifiable information) is paramount. 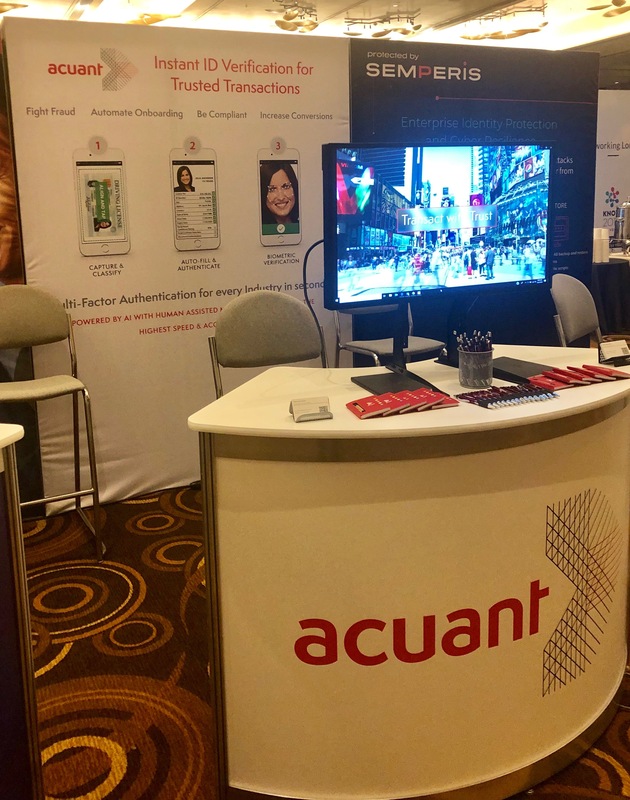 Acuant helps organizations build trust by providing a full suite of solutions that allow businesses to address their appropriate level of risk.